№30557080 Old analog electronic component board. №27507318 Electronic board with installed electronic components. 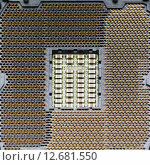 №28325487 The two finished electronic boards lie on a pink polyethylene substrate. №28245133 Electronic board with installed electronic components.